Even if in the beginning the process of printing implied mostly the transfer of the image or text from a surface to another with the development of technology and the printing machines it became more and more complex. Thus, three main stages of the process can be identified: pre-press being the procedures between creating the priting layout and the final printing, the printing process itself and print finishing. Print finishing procedures reffer to a set of well defined operations that are done post printing, such as: binding, adhesive aplicating, book jacketing, laminating or sewing which nowadays are achieved by using print finishing equipment. 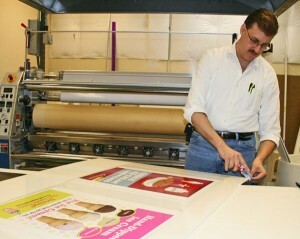 Perhaps the more complex process of printing that is used is printing and publishing books. In this case all the three stages of the printing process have equal importance starting from creating the layout to the final product which has to be designed in such a way to be catchy for the eye. Being a product that consists of multiple printing layouts put together, the pages have to be bound together. The ideea is that presentation says a lot about the product, consequently if somebody wants to give documents a finished, professional look ,a proper binding system should do the trick. Fortunately the binding equipment market offers many options: plastic comb bindings, wire or thermal binding, each one created having in mind, flexibility, style and speed. Once the binding problem is solved, the next important step is the cover. Even if we are familiar with the saying: ” don’t judge a book by its cover” the cover aspect is one of high priority. Usually ,creating the cover is the job of a specialised graphic designer with the help of computer assisted technology. There are different designs depending on the type of the book: hard cover books, case bound or paperbacks, but all of them are the results of inquisitive minds and book jacketing technology. A special type of cover is the dust jacket, a loose cover which in most cases, is a duplicate of the hard cover and acts more like a protective layout for the book itself. Any cover idea can become reality with the expertise and good book jacketing machinery. In order to satisfy the most exquisite tastes in the art of creating special effects in printing, foil stamping and embossing machines are the right answer. Foil stamping uses heat to transfer the color onto the surface and its main aplications are in text or cover papers. The effect we want to obtain is actually given by the type of foil: glossy, metallic, pearl or dull but also various patterns or grains. The other technique, embossing, consists of creating the effects by raising or depressing the design into paper. Among its aplications we can count are high quality text and cover papers. Embossing is in fact a custom craft that is why a good supplier it is very important. For any information, samples, machinery of any type, look for professional advice: http://www.allforprintmarket.com/2-printing-machines/ .